MANILA, Philippines—I found the Filipino heart on an island struggling through its worst disaster. With a backpack, a pack of Oreos and a bit of courage, I landed on Sibuyan Island on June 24, 2008, anxious about my toughest assignment yet: to cover the search and retrieval operations in the aftermath of the sinking of the MV Princess of the Stars. But beyond the grim stories of lives lost and lives changed, I saw—and experienced—a town with a big heart. The townsfolk of San Fernando welcomed strangers like long-lost friends, selflessly sharing themselves and the little left of their resources even when they had to make do. It did not take long for me to feel at home. And this sense of family, of familiarity in a place so new, led me to find intimate stories—the kind that just had to be told. No public transport was in sight at the clearing where we were dropped off by an Air Force chopper some seven kilometers away from the town proper—the only viable landing zone at the time. But I and the other journalists did not have to wait long; the locals readily offered us a ride on their scooters. My scooter “kuya” (elder brother) did not ask to be paid—a breath of fresh air from taxing Manila. I insisted on at least covering for gas. The town hall was too kind a host. The lone computer in town connected to the Internet during the early days of search and rescue was my only lifeline to the Inquirer News Desk in Manila. And the mayor’s staff always yielded the workstation when it was time for me to send my stories. On my second day there, Anna Magno, a mother of five, recalled how she had lost her seaside home to a storm surge never before seen on the island. She and her children, all very young, were among the evacuees who slept in a classroom in the town’s elementary school, turning desks into beds and the muddy hallway into a kitchen. In a coastal barangay near the sunken ferry, fishermen lamented their unwanted idle time. There was a feared toxic leak from the shipwreck and fishing was banned in the rich waters of the Sibuyan Sea, keeping fishermen and their boats onshore. But everywhere reporters went, the residents were ready with smiles and hearty greetings, often asking if we had eaten or had slept well. To have strangers look after you in a place not your own kept the energy going despite long hours under the sun. It eased the heavy feeling I always carried with me after a day at the site of the sunken ferry, where death and grieving became a daily fare no one can ever get used to. Toward the end of my stay, Tita Nitz, our surrogate aunt who offered reporters a comfortable place to sleep, said the owner of the house—a cousin now living abroad—had called to say he was waiving our lodging fee. We may never repay such generosity but we had to insist. So much good was going around that no price can ever match all the kindness, certainly not the meager amount we virtually forced Tita Nitz to accept. Hugs and exchanges of contact details sent me off on the way back to Manila. Back at work in the city, I’d always stare at the unsightly “X” tan line my sandals left on my feet from those Sibuyan days. I kind of wished the mark would stay longer. More than just reminding me that I should have applied more sun block, the pale “X” on my sunburned feet was my badge—a badge that I had touched the heart of Sibuyan. - An environmental group has urged the incoming Aquino government to rectify the great injustice committed against the people of Sibuyan and Mother Nature by issuing an executive order that will cause the immediate resolution of the case involving victims of the M/V Princess of the Stars tragedy. Roy Alvarez, president of EcoWaste Coalition, said the executive order should cause the completion of the retrieval operations, including the recovery of the remains of the victims and their decent interment upon proper identification, and ensure just compensation for all victims, as well as the environmentally-sound removal of the ship and exhaustive cleanup of the Sibuyan shores. “The long overdue removal of the M/V Princess of the Stars is causing untold suffering to the people and environment of Sibuyan, which has earned the distinction of being called the ‘Galapagos of Asia’ for its rich biodiversity,” he said. In solidarity with the Sibuyan people, the EcoWaste Coalition threw its support behind the latest plea made by the Our Lady of Re­medies Parish in the municipality of San Fernando and the Sibuyan Island Sentinels League for Environment Inc. (Sibuyan ISLE) on the occasion of the second anniversary of the sinking of M/V Princess of the Stars on June 21. Fr. Noel Sixon and the Sibuyan ISLE scored concerned private companies and governmental agencies for failing to keep their promise of retrieving the remains of the victims still trapped inside the sunken ship and the removal of the ship itself from the coast of the famed Sibuyan Island. Rodne Galicha, coordinator of Sibuyan ISLE, a partner group of the EcoWaste Coalition, said garbage washed ashore has transformed the seashore into a virtual dumping ground. Aside from the huge containers of rotting cigarettes and other products stocked along the coast, Sibuyan ISLE reported that a company contracted for the initial retrieval operations had built three pits for waste disposal in Barangay Taclobo, San Fernando, contravening the local government’s directive not to leave any trash in the vicinity. “The dumpsites are in clear violation of Republic Act 9003 or the Ecological Solid Waste Management Act and Republic Act 9275 or the Clean Water Act, which both forbid open dumping to prevent environmental pollution,” Alvarez said. “We earnestly hope that P-Noy will give high priority to resolving this still evolving human and environmental tragedy during his first 100 days in office. The families of the victims and the people of Sibuyan have suffered long enough,” he said. SIBUYAN, Romblon, June 21, 2010— Residents of San Fernando in Sibuyan Island are urging President-elect Benigno Aquino to order the immediate retrieval of sunken ship M/V Princess of the Stars. Two years since the boat sunk off the coast of Sibuyan island, full retrieval of the victims’ remains and other cargoes are yet to be accomplished. Fr. Noel Sixon, parish priest of Our Lady of Remedies in San Fernando town lamented the inaction of concerned companies and agencies directly responsible for the retrieval operations. “How many times that they promised to retrieve the sunken ship completely? Two years is enough for these promises. We pray for justice for these souls who have been taken for granted, who are still trapped in the indifference of the concerned agencies and companies,” Sixon said. The tragedy has severely affected not only the lives of the victims’ families but his parishioners as well, the priest said. “There are a lot of things to be done after the tragedy, not only the trauma and sadness of the bereaved family but also the lives and livelihood of my parishioners who are gravely affected by the typhoon which are left forgotten,” he said. Taclobo village chief Arturo Mortera also demanded the immediate retrieval of the ship saying the people cannot anymore take another year of promise. “As we seek justice for our fishermen and those who were affected, we demand for the complete retrieval of the remains of the passengers which are still trapped inside the ship, these poor souls are already part of our community,” he added. A fishing ban was implemented after the sea tragedy which has affected many fishermen who depended on fishing as their main livelihood. And even after the ban was lifted, fishing was deemed unsafe because of oil leak coming from vehicles trapped in the belly of the ship. Rodne Galicha, coordinator of environmental group Sibuyan Island Sentinels League for Environment Inc. (Sibuyan ISLE) said the wastes and garbage washed ashore transformed the seashore into a virtual dumping ground. “Huge containers have been stocked along the seashore with putrefying cigarette packs and other products, oil leaking from the ship and unretrieved cars and trucks, the remains of the victims still trapped, garbage pits on the island—these are some realities which continue to worry our island-people,” he said. An earlier report also said the salvor company built three garbage pits in the area for waste disposal despite restrictions from the local government not to leave any waste in the area. Galicha said the Aquino administration should include the completion of retrieval operations in the agenda of his first 100 days in office. “In the first 100 days of incoming President Benigno Aquino, we urge him to look seriously into this tragedy with a sense of urgency,” he said. Sibuyan ISLE Exec. Dir. Rod Galicha with an LGU mountain ranger and an IP volunteer in a landslide site in Brgy. Panangcalan during the Typhoon Feria. This is one of the 25 landslides in the municipality of San Fernando. Cantingas River Resort devastated by strong Cantingas River currecnt in Brgy. Taclobo destroying Cantingas Bridge during the Typhoon Feria. Ipil River overflowed and destroyed Ipil Bridge in Brgy. Panangcalan. To the right is the town proper of San Fernando which was inundated last year. THE National Disaster Coordinating Council (NDCC) reported on Thursday that casualties remained low as Tropical Storm Feria moved toward Northern Luzon in preparation for its exit this weekend. As of Thursday afternoon, the number of deaths was reported at seven, with eight missing and five injured. Most of the deaths were recorded in Quezon province. In its report, the NDCC identified the fatalities as Roberto Longaza, Ruben Rajas, Boyet Drias, Ryan Brogada, Vicente Layague, Edgar Salida and a certain Renico. Four of the victims were crew members of a small fishing boat, MB Annabel, that was hit by a tornado while it was anchored at barangay Sanguirin, Perez, Quezon, on Wednesday night. The NDCC said rescue teams are still searching for eight persons who are missing in Romblon, Sorsogon, Aklan, and in Guiuan and Biliran, both in Eastern Samar. On Wednesday the council pegged the number of missing at 10, but it said the number went down after two of them, both fishermen, were found alive in Southern Leyte. On the other hand, the number of damaged houses has breached the 5,000 mark, and these are all in the provinces of Quezon, Batangas, Cavite, Romblon, Masbate, and Eastern and Western Samar. Meanwhile, reports reaching the Department of Public Works and Highways (DPWH) said heavy rains spawned by Feria damaged several infrastructures, closed several major thoroughfares to traffic and triggered landslides. Public Works Secretary Hermogenes Ebdane Jr. said among those affected were the Cantingas, Ipil and Ituralba-reinforced concrete girder bridges; Pili, Cansapay and Silum steel bridges and the Cantingas bailey bridge, all along Sibuyan Bay. All of the bridges have been shut down to traffic. Ebdane also said that the circumferential road in Sibuyan was closed to vehicles after rains washed out its approaches. Likewise, the Calatrava-San Agustin-Santa Maria Road in Romblon was also closed to traffic for hours after it was struck by a series of landslides. The same with the Catmon Bridge in Masbate province owing to an eroded approach. In Central Luzon, Ebdane said the Candaba-San Miguel and the Baliwag-Candaba roads were closed to all types of vehicles owing to flooding, along with the Nueva Ecija-Aurora Road that was hit by a landslide. In Eastern Visayas, the Sambulawan-Calasigue-Calubian, Lemon-Leyte-Biliran and Bato-Bontoc Roads are also hardly passable owing to landslides. Fallen trees and rocks also made it hard to pass along the Catbalogan North Road, Catbalogan-Calbiga and Samar-Leyte Roads. In Western Visayas, the Arellano Bridge in Panay, Capiz and Bogo Bridge in San Remegio, Antique were also washed out. In Malabon, flooding also rendered Sanciangco Street and Bustamante Street all the way down to Governor Pascual Avenue impassable to all types of vehicles. Ebdane ordered maintenance crew to work for the immediate opening of all the affected roads and bridges. The NDCC said Feria, which entered the country through the Visayas on Monday, affected a total of 172 barangays in 15 regions in the Visayas and Luzon. It also affected a total of 11,463 families or 53,897 persons as of 12 noon on Thursday. With the UK-based humanitarian organization, Christian Aid (CA), responding to the call for help of Sibuyan ISLE/SAM, together with the Legal Rights and Natural Resources Center, Inc. – Kasama sa Kalikasan / Friends of the Earth Philippines (LRC-KsK/FoE Phils. ), the Task Force Sibuyan Relief Operations was convened two days after typhoon Fengshen (Frank) devastated Sibuyan Island. The AMRSP as partner of Sibuyan ISLE in its environmental advocacy, initiated relief drives with its members through schools and congregations, as well. La Salle Green Hills (LSGH) is one of the schools which quickly responded to the call together with the College of St. Benilde (CSB) of De La Salle. Through AMRSP, LSGH sent relief items which were repacked at the Claret School of Quezon City (CSQC). St. Scholastica’s College (SSC) of the Benedictine nuns sent relief items, too. 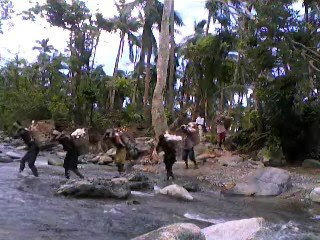 The relief items which weighed approximately 40 tons were transported to Sibuyan Island on 21 July 2008. Distribution by land and sea was done through the Basic Ecclesial Communities and Parish Social Action Centers of the Vicariate of Sta. Barbara (Sibuyan Island) of the Diocese of Romblon in coordination and monitoring of Sibuyan ISLE, LRC-KsK/FoE Phils. and CA. Selection of beneficiaries was based on international humanitarian standards prescribed by the SPHERE Project. General qualification is that the recipient should be poorest of the poor, which responds to the Catholic Church’s preferential option for the poor, hence, hierarchy of prioritizations and screenings was prudently and justly considered. More than 3,500 households (approximatey 17,000 peope) have already benefited from the relief operations. Notably, the task force experienced bringing the relief items directly to the beneficiaries by taking motorized bancas and a 7-kilometer walk with the indigenous peoples passing through rivers because the roads are not still passable. The assessment shows that: a) there is an on-going food shortage due to the possible toxic contamination of chemicals from the sunken MV Princess of the Stars, hence, fear of fishing and expensive food sale; b) agricultural crops were gravely devastated especially coconut, vegetable and banana plantations; c) roads in gravely stricken villages are still not passable; d) at least two coastal elementary schools were gravely damaged, percentage of absences of students is increasing because fishing which is generally the source of income of families is limited; e) the people especially the children are still traumatized of the typhoon and the sunken ship’s ramifications. The task force complied with the international humanitarian standard of conducting relief operation in just one month, that is from June 25 to July 25, especially in the isolated island of Sibuyan. ROMBLON, Romblon – President Gloria Macapagal-Arroyo today ordered the inclusion of the province of Romblon in the list of provinces placed under a state of calamity after the destructive wake of typhoon Frank some three weeks ago. President Arroyo announced the directive at the Romblon National High School here where she was briefed by local officials about the the possible outbreak of typhoid fever here and in Odiongan town; plus the diarrheal cases in the San Fernando town. In his letter to the President, Romblon Gov. Natalio Beltran III appealed for the inclusion of Romblon in the said calamity list ‘so that we can avail of whatever support and assistance that may be granted by the national government’ for Frank-affected local government units (LGUs). The Romblon governor added that the PDCC was also ‘so pre-occupied in assisting the rescue operations on M/V Princess of the Stars of Sulpicio Lines which sunk in the Sibuyan Sea near the municipality of San Fernando, Romblon,’ thus its failure to immediately report on the total provincial damage which would have easily included it in the list of LGUs placed under a state of calamity. In his letter ot the President, Beltran attached Resolution No. 06-2008-65 of the Sangguniang Panlalawigan of Romblon dated June 27, 2008 declaring the province of Romblon under a state of calamity. Also included was the Romblon PDCC disaster report. In this capital town alone, Mayor Gerard Montojo said the 31 barangays suffered a total of P70 million in infrastructure damage, including some 7,000 houses worth P31 million damaged either totally or partially. Some P31 million worth of crops were also destroyed here, including P10.5 million worth of banana plants, P8.5 million in fisheries, P6 million in coconut trees, and P3.5 million in fruit trees. It is the second time that President Arroyo is visiting this province to check on government’s efforts to help alleviate the lives of residents affected by the super typhoon that sunk the biggest ship of Sulpicio Lines. Two Tuesdays ago, President Arroyo was in Sibuyan island where she commiserated with affected residents by distributing relief goods, and then later pouring holy water into the Sibuyan Sea where the sunken Sulpicio ship still remains embedded in the coral reef. Ang pangangalaga sa kalikasan ay nagsisimula sa loob. Ako ay bahagi ng sangkalikasan. Ako ay kalikasan.